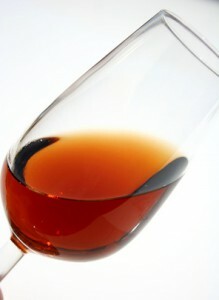 Jerez de la frontera, in the heart of the province of Cadiz, is synonymous for the English word ´sherry´ -jerez – the delightful sweet wine which comes from this town and its surrounding vineyrads. 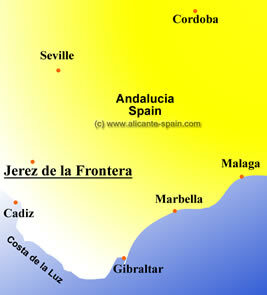 Jerez de la Frontera, literally translated Jerez at the Border, was once a natural border or barrier between the Christian and Morrish regions of Spain. As Jaen was known for its flat extensive olive green hues thanks to its olive trees and products, Jerez de la Frontera is covered with shades of lighter greens and dark purple fields. These vineyards, always exposed to the intense sunshine, is what makes Jerez´s grapes so rich in sugar content and such a sweet sherry wine. Thanks to the Phoenicians and their genial idea of planting vines for sherry, others took up on the idea and have made it a prosperous business. One of the first nations of traders who appreciated this jewel and started manufacturing and doing commerce with it was the British. 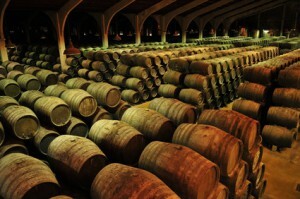 There are many ´bodegas´ or wine cellars producing sherry and many offer interesting tours to show their bottling plant, ageing process, tasting and sale of their best reserves. Jerez de la Frontera is privileged geographically not only for its wine production but also for its nearness to the Atlantic beaches and shores, the lovely setting of the Guadalquivir and the mountain range of Cadiz about 30 kilometres away. Its year round sunshine and warm temperatures make Jerez de la Frontera an ideal tourist attraction and very accessible through the new International Jerez Airport with superb combinations with other important Spanish and European airports. 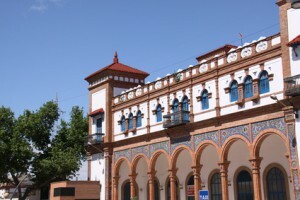 And with the new railway system and the AVE high speed train, the Jerez station, located at Plaza de la Estacion, is always bustling. As in all towns, the churches and museums with paintings always seem to be the main attraction, but in Jerez it is different. Let´s go to specialised museums hardly seen elsewhere. 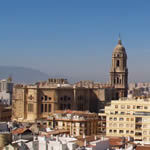 The Clock Museum found in the Atalaya Palace in Cervantes Street is open from 10-7 and it is where we can feast our eyes on over 300 clocks from all over the world. This impressive museum comes from an 18th c wine trader who was always worried about time and decided to collect magnificent clocks from France, England, Austria and Italy to decorate his palace. It is known as the largest selection in the world. When we first come into the palace through the Welcome Patio, we are blinded by the huge Bohemian crystal chandelier. Then we are swept back in time when we step into the Louis XV Room. The Gold Room, one of the best rooms, has an impressive fresco painted on the vault. And the Theme Room shows us original objects grouped together by countries. On the upper floor in the Capitone Room, we find the most intriguing clocks and pocket watches ever. And still another room, the Chapel and Bell Room unfold its colourful tapestries as we listen to the chimes of the great clocks which have counted time in history. As I mentioned before, the museums in Jerez de la Frontera are very distinctive from the ones usually visited. There is a keen interest for horses in the south, especially in this town. We can visit the Horse Carriage Museum set up in an old Pemartin sherry house. Starting in the Forecourt, there is a practise arena where one gets the first glimpse of Andalusian horses. Then, we can go onto the main hall, which still preserves the sweet impregnating smell of sherry, to visualise the 12 most adorned carriages with bells and ribbons, so typical in the south. There are also some Russian, English and Hungarian tack or equipment which is used. To better understand the equestrian world and history, here is an interactive video which explains the different celebrations these carriages were used in, how they were driven back then and now, some information on the horses used for these carriages and the one used in princess Elena´s wedding. In the nearby stables we can actually visit with some thoroughbred spanish horses and take a glance at some more carriages and equestrian paintings. Flamenco is also such an essential part of Andalusian life and you can uncover places where sacred spanish song are sung flamenco style. This spanish music is always present at the many festivals which are held all year round. 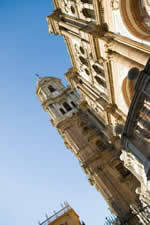 Easter is a very emotional and spectacular time to be in jerez or anywhere in the south with its Nazarine parades. 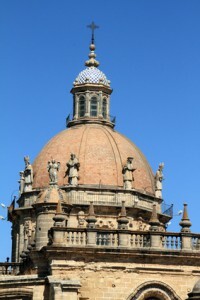 September is harvest time and is heavily celebrated with wine parties and bullfights. Quite nearby there are various natural parks and reserves which would be a fascinating outing to do. You can visit the Grazelema nature reserve or Donana with a previous reservation. Being as Jerez is near the ocean, we can sink our teeth into a scumptious red snapper made with fresh vegetables and wine, of course, lobster salad in a vinegar sauce or a more typical but tasty bull´s tail stew. To wind down and finish up your stay in Jerez, do a little souvenir shopping where you can discover hand-painted fans, beautiful ceramics and some home made sweets in the convents to put the fianl blessing on our trip to Jerez de la Frontera, Spain.